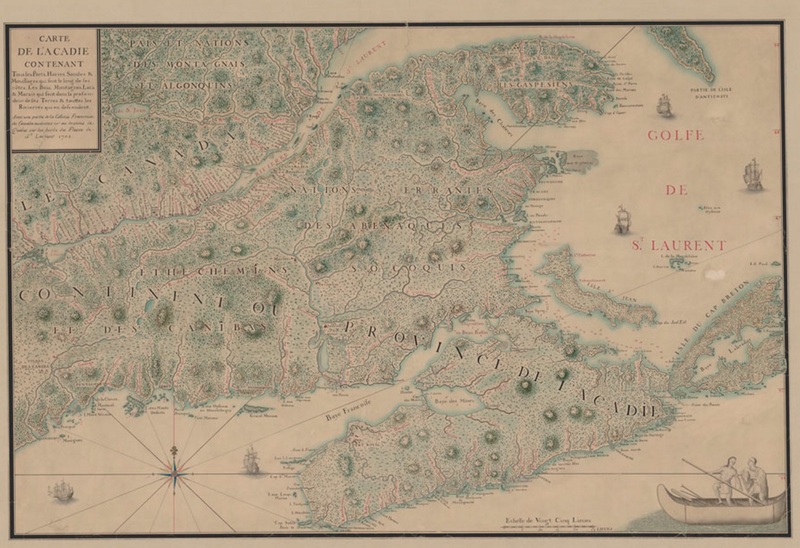 This map from 1702 by Jean-Baptiste-Louis Franquelin depicts the area that would become New Brunswick and Nova Scotia. A part of Quebec is shown too. At the time this area was known as Acadia, a French colony. The map shows all the ports, harbours, forests, mountains, lakes, and rivers along the banks of the St. Lawrence. (In case you were wondering what the little French blurb in the corner says). Franquelin was actually the first official cartographer of Canada. Born in Saint-Michel de Villebernin, France in 1650, Franquelin came to New France in 1671 and became a successful fur trader. His work gave him first-hand experience with the lay of the land and in 1674 Governor Frontenac asked Franquelin to become a cartographer. Louis Jolliet’s most recent map detailing his expedition along the Mississippi River was drawn largely from memory. The governor wanted a more proper map and he must have liked what Franquelin drew because after that he was the go-to guy for maps. By the late 1680s, Franquelin found himself drawing maps of New England for King Louis XIV to assist with their war effort against Great Britain. 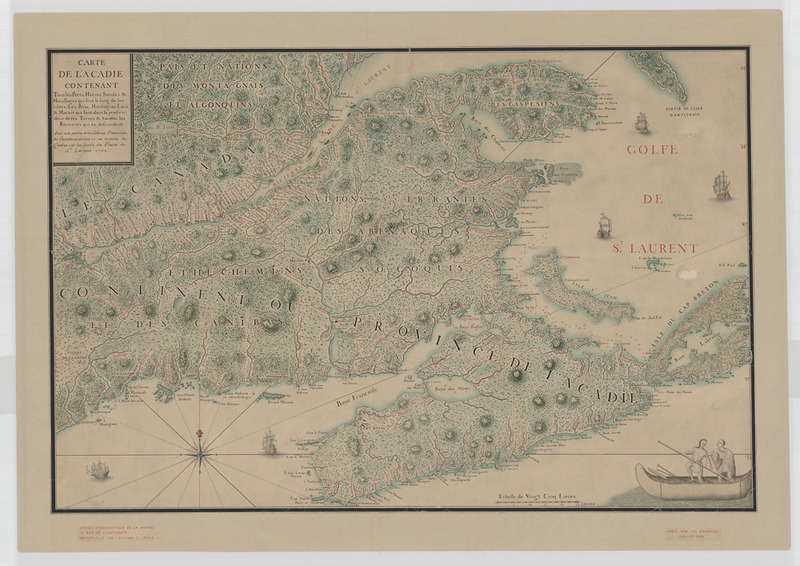 Despite his titles as the official cartographer and hydrographer of Quebec and the fact that he drew around 50 maps of the area, Franquelin never returned to New France. He died in France sometime after 1712. On the map you can see the inclusion of the Montagnais and Algonquin nations; referencing Indigenous Peoples again in the bottom right corner. Quebec is referred to as Le Canada (upper left corner). The Gaspé Peninsula is Les Gaspesiens. Unlike previous maps, this one has heavier terrain detail. That’s how Franquelin stood out among his peers. He used colour with his maps and and decorated unexplored areas with trees and animals. Now the use of colour and drawing nature on maps was not new, but putting them together was. You wouldn’t know it from the map, but it depicts Acadia at the start of Queen Anne’s War (1702–1713) aka the War of Spanish Succession. It was a war that ended badly for France. Louis XIV would cede Acadia, Newfoundland, Hudson Bay, and St. Kitts to Great Britain in the Treaty of Utrecht. This event is essentially the start of the eventual Expulsion of the Acadians (1755-1764) which saw the British forcibly deport the Acadians from their homes. M. W. Burke-Gaffney, “FRANQUELIN, JEAN-BAPTISTE-LOUIS,” in Dictionary of Canadian Biography, vol. 2, University of Toronto/Université Laval, 2003–, Accessed from: http://www.biographi.ca/en/bio/franquelin_jean_baptiste_louis_2E.html.